Today only, shop the deals at Gap Canada and save an extra 30% on your purchase when using this promotional code. As usual this promo cannot be used on gift cards or previous purchases. And don’t forget that shipping is free on orders of $50 or more, before taxes. 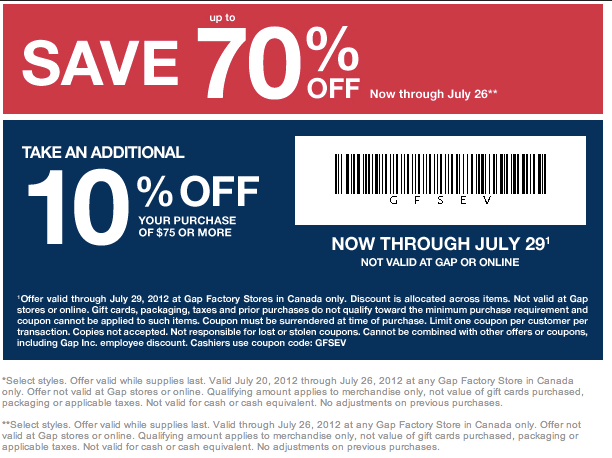 We also have a printable coupon that you can use in all the Gap Factory stores to save 10% on any purchase of $75 or more. It expires only on the 29th of July. Coupon: Save an extra 30% on all discounted items at GapCanada.ca. Print this 10% off $75 in Gap Factory stores.